Knowing the trustees' vindictive track record and to safeguard our interests Arunashri, Nivedita and myself, went to Delhi. In the first week of April 2005 we met Dr. Girija Vyas-ji, the then NCW Chairperson and Mrs. Nirmala Sitharaman-ji, the then South Zone Head of NCW. 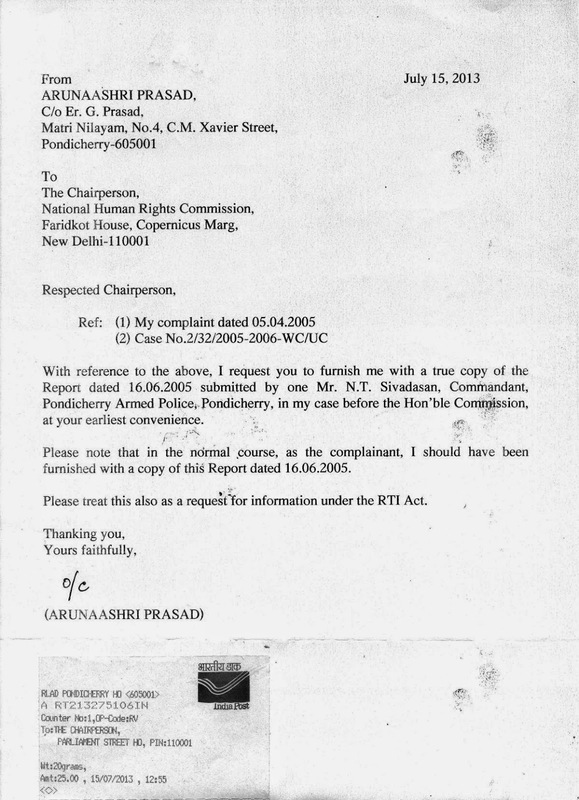 We asked whether any report of enquiry had been submitted by SWC to NCW, as alleged in ‘The Hindu’ on 19.01.2005. We also informed them that no such copy had been furnished to us, in spite of our request, by SWC and if we could be provided with a copy of this alleged enquiry report. Even though the office was searched, no report to this effect was found. So, we requested Dr. Girija Vyas-ji to reopen our case and help us. She assured us help but said no relief could be given immediately without going through the case records. Desperate for immediate relief we approached the National Human Rights Commission, New Delhi, (NHRC). After hearing us patiently Dr. Justice Shivaraj Patil-ji, (retd.) then a member of the commission, expressed unhappiness at our plight and harassment, especially since the same was being caused at Sri Aurobindo Ashram, Pondicherry. He had been a former Justice at Madras High Court and had great regard for Ashram. He directed us to give a written complaint, which we did on the same day of our meeting. 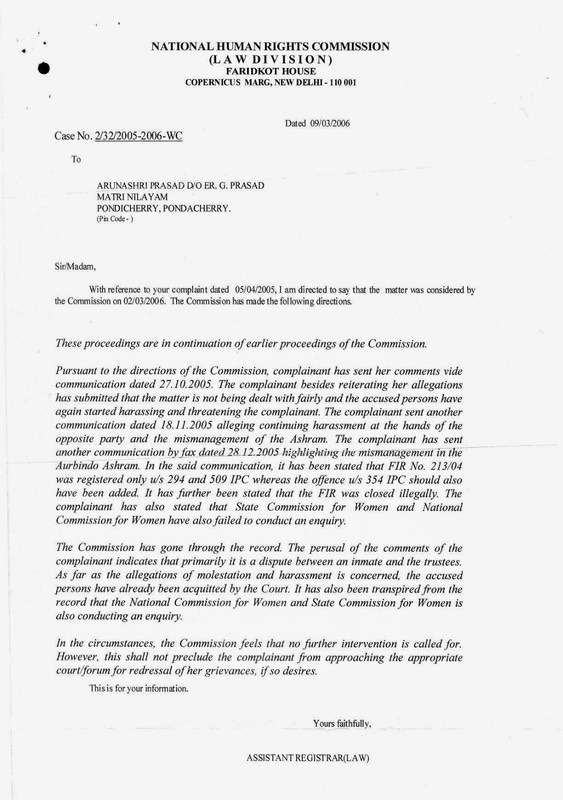 In May 2005 Arunashri received intimation of an enquiry being conducted by IGP, Pondicherry, on behalf of NHRC. A big drama ensued since without conducting any enquiry IGP Mr. Meena, had already sent his report, based on the media clipping of 19.01.2005 and the alleged acquittal of the accused in S.T.R. No.7919/2004 (based on F.I.R. 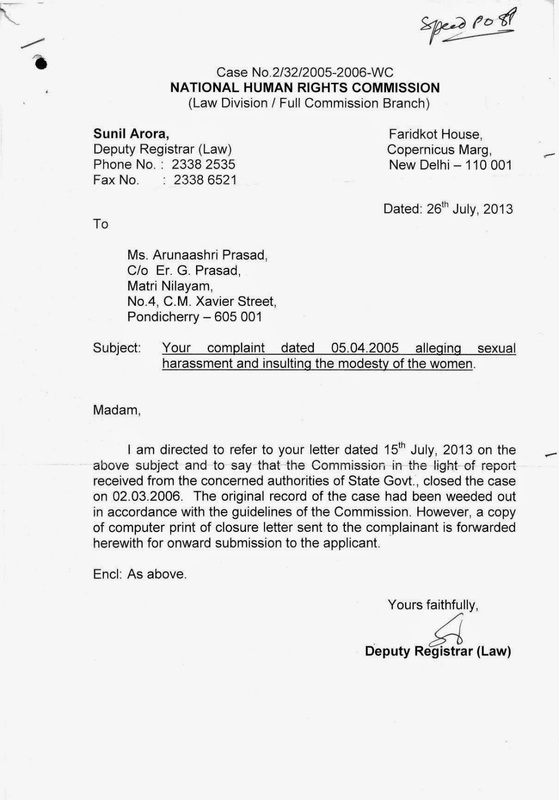 No.213/2004 filed for our sexual harassment). (See posting dated 19.09.2004, 14.10.2004, 09.05.2005 and 18.10.2014 about corrupt police). Pretending to correct their illegal act, Mr. Meena, (then IGP) constituted an enquiry by appointing one N.T. Sivadasan, as the enquiry officer, who also conducted no proper enquiry. However his alleged report never reached us nor was ever forwarded to NHRC. The trustees fabricated this report in 2008 with the help of N.T.Sivadasan for filing the same in their C.R.P. No.3314/2007. The trustees also circulated this report as report of NHRC to thwart our claims of sexual harassment and project us in bad light. (See posting dated 15.07.2008). NHRC has closed our case and issued orders dated 07.11.2005 and 24.03.2006, stating that since NCW was investigating the matter, no interference was needed. On receipt of N.T.Sivadasan’s report we filed application under RTI for a copy of it from NHRC. There is no mention of N.T.Sivadasan’s report in their communication. Our RTI application and the answer from NHRC are produced below.